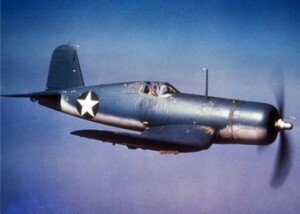 On the afternoon of May 6, 1945, a flight of seven navy Corsair fighter airplanes took off from Groton Naval Air Station in Groton, Connecticut, for a training flight. About eight miles north of the air base the pilots began practicing a series of various maneuvers and formation flying. At one point the flight leader initiated a “follow the leader” exercise. One of the pilots, Lt. (jg.) David Lee Johnson, 23, of Jamaica, Long Island, N.Y., was the last man in the first flight division. As the line of planes were going through a series of rolls at 3,000 feet, Johnson’s aircraft, an F4U-4 Corsair, (Bu. No. 81395), suddenly nosed over and crashed. The aircraft exploded on impact and Johnson was killed. The aircraft came down on a farm in Ledyard, impacting just fifty feet in from the roadway. Lt. (jg.) Johnson was assigned to VBF-152. Source: National Archives, TD450506CT, via Larry Webster, Aviation Historian, Charlestown, R.I.